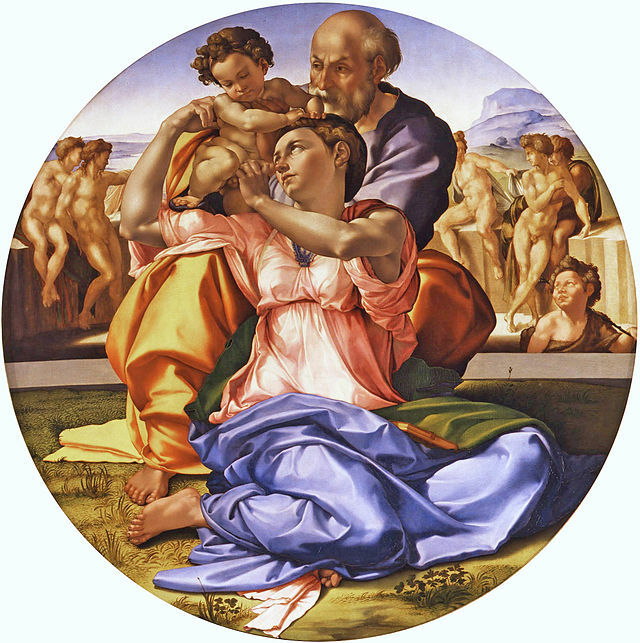 Last month I posted my initial thoughts on Michelangelo's Doni Tondo. Further reflection and reading as well as comments from friends and readers have led me to revise my interpretation. Below, find Part I of the revision. Michelangelo’s Doni Tondo is one of the greatest masterpieces of the High Renaissance. It is his only surviving panel painting and now hangs in the Uffizi in its original frame. Most scholars date it somewhere between Michelangelo’s completion of the David in 1504 and his departure from Florence to Rome in 1506. Like many of the masterpieces of this era, it has elicited many different interpretations. At first glance it appears to be simply a traditional rendering of the Holy Family but, on closer inspection, a number of questions arise. 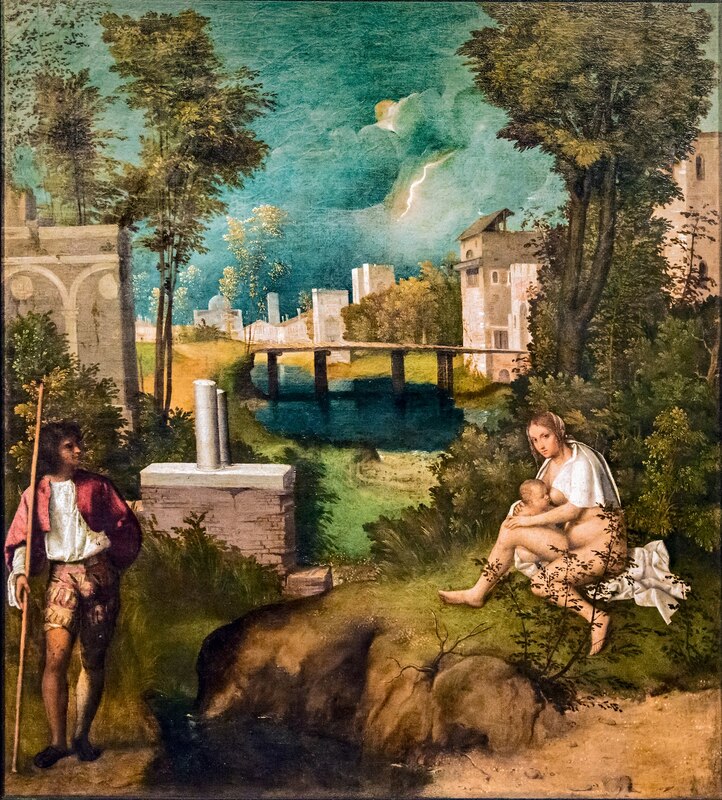 In the foreground Mary, Joseph, and the Infant Jesus are situated in a landscape. But what is going on? Is Mary handing the Child to Joseph, or is Joseph handing the Child to Mary? Why does Mary look as she does with muscular arms shockingly uncovered? What is Joseph doing in the painting? Why, despite tradition, has he been brought so prominently into the center to play an apparently key role? What is the young John the Baptist doing behind a parapet or wall in the midground? Finally, who are the five male nudes in the background, and why are they there? On the other hand, in 2003 Timothy Verdon believed that the source of the Doni Tondo could be found in Marsilio Ficino’s Neoplatonic concept of three kinds of love. As a result, Verdon argued that not only was Mary receiving the Child but that the man in the painting was not even St. Joseph. I now believe that neither view is correct. Vasari was often mistaken or ill informed but he was a close friend and confidant of Michelangelo. It would be almost the height of temerity to reject his eyewitness description of the central feature in this painting. Nevertheless, it would appear that he did not take more than a glance at the painting. For example, he saw the Madonna kneeling although she is obviously sitting. 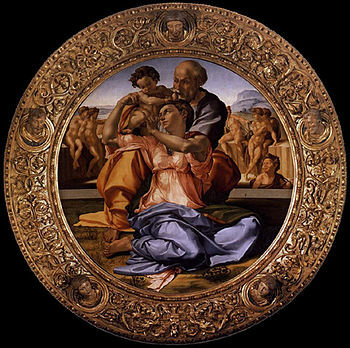 It is so easy to overlook or ignore important and obvious details in a Renaissance masterpiece, but there are significant elements in the Doni Tondo that call for a new interpretation. Rather than handing off the Child to Joseph, I would argue that Mary is actually elevating the body of her Son in the same way that a priest elevates the Host or Body of Christ at the Consecration of every Mass. The keys to this interpretation are the hands of Mary, and the posture of Joseph. The position of Mary’s hands and fingers cannot allow her to either hand the Infant Jesus off to Joseph or take the Child from him. As I pondered the painting, I asked myself where had I seen hands like that before. Eventually, I realized that Mary’s hands and fingers resembled a priest’s at the Consecration. After the Second Vatican council liturgical norms in the Catholic church were somewhat relaxed, but I remembered from my childhood that the priest would take the host between the thumb and forefinger of both hands before and during the elevation. Naturally, his other fingers would then close or cup in the shape of Mary’s as he raised the host. Since the priest’s back was to the congregation, he would raise the Host high above his head and look at it intently in the same way Mary does in the Doni Tondo. In the art of the Renaissance it was common to equate the infant Jesus lying on his mother’s lap, or on the ground surrounded by various worshippers, with the Eucharistic host. The Portinari Altarpiece is one of the best examples. The infant Jesus lies on the ground surrounded by worshippers including angels wearing the vestments of altar servers. In Franciscan theology, for example, even when Mary was holding her infant Son on her lap, she was the altar on which the Eucharist rested. Verdon noted that his view partly arose out of a conversation with the late famed art historian Leo Steinberg. In 1974 Steinberg published a brief essay on the Doni Tondo in Vogue magazine. Steinberg’s reputation was so great that practically every commentator on the Doni Tondo refers to the Vogue essay. 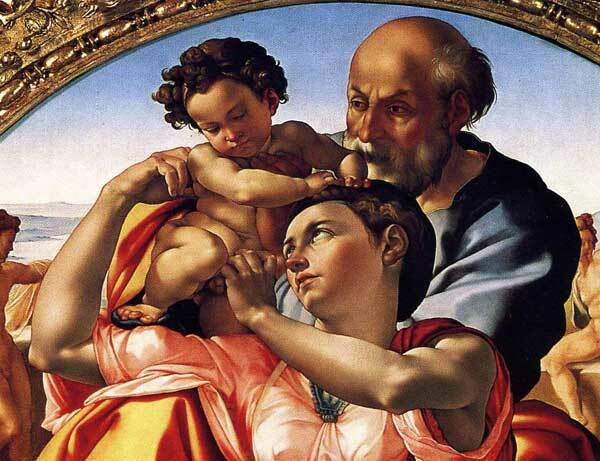 In that essay Steinberg saw deliberate ambiguity in Michelangelo’s famous painting that makes it very difficult to determine who is handing the Child to whom. But he did find four levels of meaning including a Eucharistic one. Here is his ending. I would also like to point out that the garments of Mary indicate a priestly role. Michelangelo depicted her in her traditional red dress with her blue cloak or mantle draped over her legs. But there is also a green cloth wrapped around her on which a book, perhaps a Missal, rests. Green is still the color of the priest’s vestments on most of the Sundays of the Church year. The concept of St. Joseph as protector and spouse of the Church is sufficient to explain his prominent position in the Eucharistic celebration. The man in Michelangelo’s tondo bears all the characteristics of St. Joseph as he was portrayed during the early decades of the sixteenth century. Joseph was increasingly depicted as a virile man quite capable of protecting his family especially on the flight into Egypt. One just has to look at Raphael’s Sposalizio in the Brera. In addition, the purple and gold coloring of his garments also identifies Joseph as from the line of King David. Even more than these characteristics, the posture of Joseph confirms his identification. He is behind Mary and the Body of Christ. At the consecration of the Mass the sacrifice is offered to the Father above at the heavenly altar. Also, we see that Joseph is not standing since he does not tower over the sitting Madonna. Is he squatting awkwardly? Is he sitting on a hidden stool? We can only see his right leg but it is bent at the knee. It would appear that Joseph is kneeling or genuflecting as all worshippers do as the priest elevates the Body of Christ. At the same time his left hand is placed firmly on the Infant’s chest. 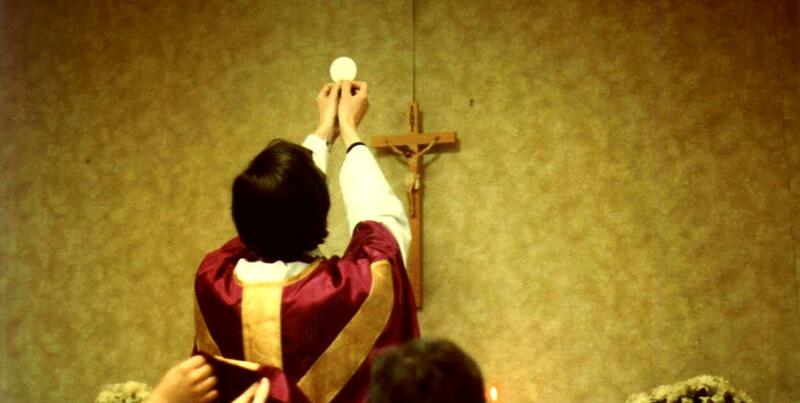 Is he actually receiving Communion or just indicating the central role of the Church in the acceptance of the Real Presence of Christ in the Eucharist? Even before the Reformation doubts had arisen about the Real Presence. The building of the great Cathedral in Orvieto in response to the Eucharistic miracle at Bolsena is one example of the Church's response to these doubts. Raphael's so-called Disputa in the Vatican Stanze is another response. [i] Giorgio Vasari, Lives of the Painters, Sculptors and Architects, translated by Gaston du C. De Vere, with an introduction and notes by David Ekserdjian, Everyman’s Library, 1996, v. II, p. 656. [ii] Mirella Levi D’Ancona: The Doni Madonna by Michelangelo: An Iconographic Study. Reprinted in Michelangelo, Selected Scholarship in English, edited with Introduction by William E. Wallace, New York and London, 1995, V. 1.Life and Early Works, p. 404. This paper originally appeared in the Art Bulletin in 1968. [iii] Timothy Verdon, Mary in Florentine Art, Firenze, 2003, pp. 97-98. [iv] Leo Steinberg, “Michelangelo’s Doni Tondo,” Vogue, December, 1974, pp. 138.